USANA Sense Nourishing Conditioner - Instantly moisturize and nourish your hair with this rich emollient of vital nutrients and botanical extracts. 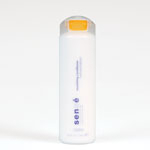 This creamy conditioner helps prevent styling and environmental damage while leaving it radiantly smooth and silky. Safe for color-treated or chemically processed hair, use this lightly scented formula every day for weightless shine and manageability.